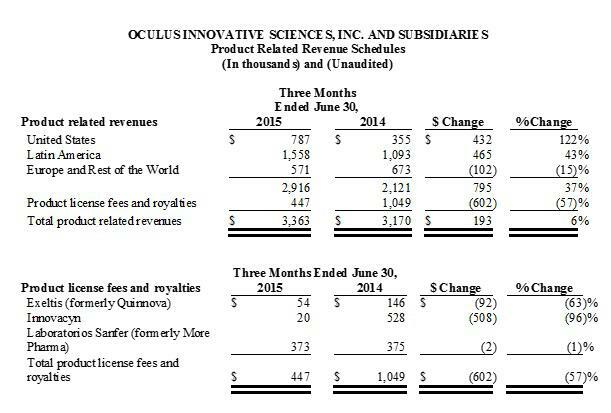 For years, Oculus Innovative Sciences, Inc. (NASDAQ:OCLS) has tried to find a home for its Microcyn technology. Jim Schutz, the company's COO until he took over the role as CEO last year has admitted that the company was "a mile wide and an inch deep" in reference to its past business relationships and market strategies. That lack of focus has caused the stock price to suffer as skeptics questioned the effectiveness of Microcyn and Oculus' proprietary technology. One of the things I look for when investing in a speculative growth stock like Oculus that has had a history of poor stock price performance is a willingness to candidly admit to past mistakes and an ability to demonstrate a realistic strategy moving forward. Looking at the commodities sector as an example, there are many examples of gold and oil stocks which aggressively drove forward with a single-minded strategy until they crashed into a brick wall of U.S. Dollar strength and find themselves divesting themselves of assets or putting themselves up for sale at very unfavorable prices in a desperate attempt to remain solvent. This is not the case with Oculus. Mr. Schutz and the remaining Oculus team have worked hard to strengthen the balance sheet (as outlined in a previous article of mine) so that the company has the cash needed to direct focus to the dermatology field. Dermatology has a demonstrated history of lucrative enterprise valuations and has a favorable competitive environment. As I outlined in another article, buyouts of dermatology companies have generally occurred in the 3.0x to 6.0x revenue multiple range while companies likeDermira, Inc. (NASDAQ:DERM) and Anacor Pharmaceuticals, Inc. (NASDAQ:ANAC) continue to have revenue multiples in the 100x range even after the recent pullback in health care stocks. With the last two quarters trending towards annual revenue in the $15 million range and growing, I believe that Oculus should trade at a minimum in the $75 million market cap and $5 stock price range. With the past mistakes behind Oculus but the stock price still reflecting a business that has no focus or traction, OCLS represents a compelling investment opportunity for investors who like health care stocks but are wary of the many recent high fliers that have seen their prices tumble in the past couple of months. Oculus has had its fair share of naysayers for various reasons over the years, some of it with merit, but this time around the company has come out swinging with a demonstrated ability to market a product that is effective, favorably priced and highly profitable. The company has disclosed the total number of dispensed prescriptions of the four dermatology products available in the market under the Alevicyn and Celacyn product lines of its wholly owned subsidiary, IntraDerm Pharmaceuticals. The business has grown from zero prescriptions in October 2014 to a high of 3,000 in July 2015. August pulled back slightly to about 2,800 prescriptions, ending the company's streak of nine months of sequential growth, but IntraDerm is set to start a new streak of month-to-month growth as Oculus started to ship a post procedure pack of Alevicyn and Celacyn and a branded oral drug to its wholesalers in September in preparation for the product launch by the end of 2015. The prescriptions are growing because dermatologists believe that the Microcyn technology in an effective treatment for their patients' conditions. A recent article on Oculus does an excellent job in summarizing the advantages to using Celacyn as a prescription scar gel, driving over 6,000 prescriptions for that product alone since November 2014. Oculus has been accused of selling "overpriced bleach" when the evidence points to the opposite being true. If anything, Oculus is coming up with products that are cheaper alternatives to their competitors. 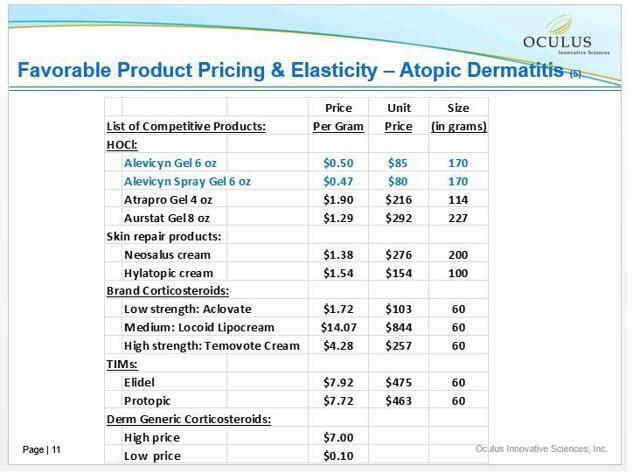 On page 11 of the investor presentation, Oculus outlines the cost of the Alevicyn gels against various alternatives to the treatment of atopic dermatitis. Alevicyn comes in at a price per gram of $0.50 while the spray gel is at $0.47, well less than half of the price than the next cheapest competitor and less than 10% of the price of the high end products available for atopic dermatitis. Alevicyn is not going to be for all sufferers of atopic dermatitis, but that is no different than any other condition where a variety of strengths and mixes are needed to cater to various severities as well as consider preferences and allergies of the patient. The important thing to note is that Alevicyn is clearly gaining traction at the low-end/low-strength sect of the market without disqualifying itself as a potential solution for patients who currently have to pay for a much pricier product. Oculus management knows from past experience that a great product at a competitive price is not going to be enough to assure a successful business. So the company has been aggressive with hiring sales people who are experienced in the dermatology industry. It hired 10 sales people for the original push with the intent to increase that to 14 by the end of 2015 and 20 in 2016. The high margins associated with the dermatology business allows for that business to cover its $40K per quarter in direct field sales costs within the first year, essentially hitting the breakeven point when excluding an allocation of indirect corporate overhead. How has the rising dermatology business impacted financials? 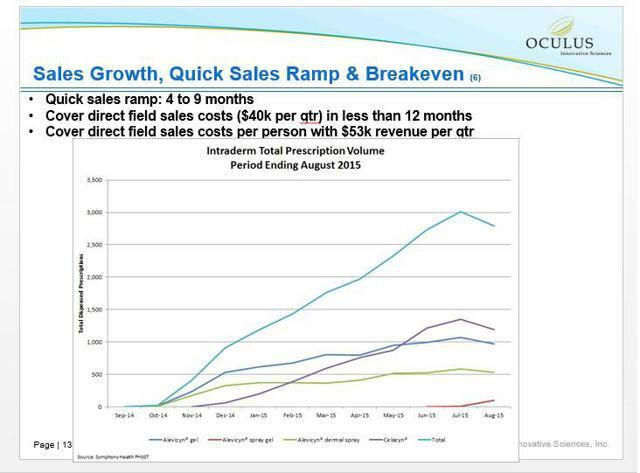 Oculus' revenue has been trending upwards for calendar year 2015, driven by an increase in product revenue. Oculus does not report IntraDerm numbers separately from its legacy businesses, however IntraDerm is exclusively in the United States at this time and comprises a significant part of the company's overall U.S. product revenue, so that line item would be a close enough proxy to determine how the business is doing. Presented below is the revenue by region for Q1 2016 (ended June 30, 2015) and Q4 and full year 2015 (ended March 30, 2015). U.S. product revenue was up $582K or 41% to $2 million for 2015, but the bulk of that growth was in Q4 which saw a 117% increase or $336K from $287K to $623K. This aligns to the introduction of the dermatology products last October as the products were shipped to the wholesalers in preparation for the expected growth in prescriptions in 2015. The trend has strengthened in Q1 2016 as the product revenue in the U.S. was $787K, a $432K/117% increase from Q1 2015 and a sequential growth rate of $164K/26% over Q4 2015. The company achieved a total of 4,374 prescriptions in Q4 2015 which increased by 61% to 7,028 prescriptions in Q1 2016. Since revenue is recorded at shipment which is several weeks in advance of prescriptions being written, we can expect short-term variations between the growth rate in prescriptions and the growth rate in revenue depending on the level of inventory held by the wholesalers. Revenue can also be impacted by Oculus' rebate program for those who are uninsured. 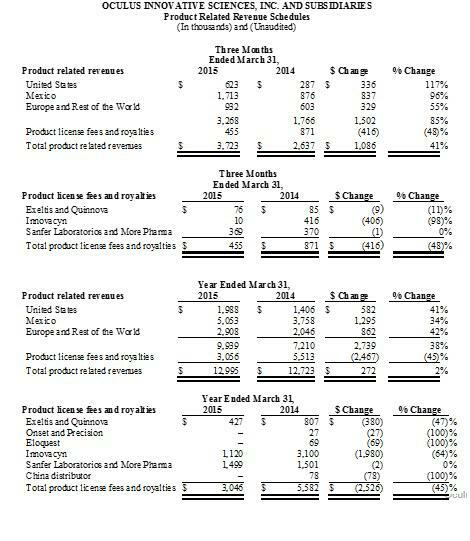 But the growth rate in prescriptions and dermatology revenue will be tightly aligned over the long term so prescriptions can only outpace revenue growth for so long as wholesalers will start ordering in bigger shipments once they see that the Alevicyn and Celacyn product lines are moving. Oculus increased the price of the Alevicyn gel from $45 to $85 which took effect in October. The expectation of increased unit sales as well as the higher price bodes very well for the company's U.S. product growth over the next several quarters. As the company has disclosed prescription numbers for July and August, it is possible to come up with a reasonable estimate of growth in U.S. product revenue for Q2 2016. Total prescriptions will likely be in the 8,500 range for the quarter, a 21% increase from Q1 2016. I expect revenue growth to be in line or slightly exceed this number as wholesalers try to build up their dwindling inventory of the existing product lines as well as start ordering the new products. A 25% to 30% increase in U.S. product revenue from Q1 would lead to revenue of about $1 million for the quarter and will be a top driver for another solid quarter of growth for Oculus. This growth will be partially offset by negative revenue drivers in the legacy businesses which are no indication of the company's potential going forward - weak international currency performance versus the U.S. Dollar and a declining revenue stream from past partnerships that are running their course. As time goes on, dermatology revenue will make up a substantially higher percentage of overall revenue as the legacy revenues grow less robustly and the royalty revenue dries up. I believe that Oculus will eventually be regarded as one of the few dermatology plays listed on the NASDAQ and its stock price will reflect a valuation more similar to the high fliers of DERM and ANAC. Considering that OCLS has a price to sales metric of just 1.4, it has a long way to go before it comes anywhere near those kinds of lofty valuations. Disclosure: I am long OCLSW, which are warrants on OCLS expiring in 2020 at a strike price of $1.30. They act similar to call options. I believe the warrants are under-priced given the long time to expiry and the volatility on the stock. Warrants represent a leverage opportunity and a risk management tool. For instance, a purchase of warrants at $0.30 when the stock price is $1.20 will result in intrinsic value of $1.10 if the stock price doubles to $2.40. Conversely, the warrants are worthless if the stock is under $1.30 upon expiry in 2020. But warrants can also be used to manage risk because an investor can put up less capital in OCLSW for the same dollar amount of upside compared to an investment in OCLS. Owning warrants is within my risk tolerance. Investors should decide if warrants are within their risk tolerance independently of my recommendation. I have been paid for this article. I purchased OCLSW prior to any contact or relationship to the company and this article is an accurate representation of my opinion on OCLS.